The World Breastfeeding Trends Initiative (WBTi) is a tool to help countries assess their implementation of key policies and programmes. These are drawn from the WHO Global Strategy for Infant and Young Child Feeding, which was adopted by the World Health Assembly, including the UK. The first UK World Breastfeeding Trends Initiative report was published in November 2016 and launched at the Houses of Parliament. Its ten policy and practice indicators address the extent to which there is an infrastructure in a country to support breastfeeding. The process brought together organisations and agencies working in maternal and infant health to monitor progress, identify gaps and generate joint recommendations for action to address those gaps. What is Indicator 1 about? Women have autonomy over their own bodies so decide for themselves how to feed their babies but it can be very hard to carry a specific intention when the environment is unsupportive. It’s similar to the situation faced by someone who wants to avoid becoming overweight in an environment where tempting food is heavily advertised and easily available. A UK mother who wishes to breastfeed is likely to face barriers to achieving her goal throughout her breastfeeding journey. How can the situation be changed? An efficient way that can help to achieve consistency across the country is to have national leadership – a national coordinator with sufficient authority, a representative high level committee and a plan or strategy for change, as described in Indicator 1. Breastfeeding Policy Matters in 2015 highlighted the importance of this and the processes needed . Scotland and Northern Ireland have national leadership in place but England does not. Yet the rhetoric is there. The 2016 government guidance from Public Health England, Health matters: giving every child the best start in life explains why the early years are so crucial . It lists some of the health benefits and states that ‘creating the right environment to promote and support breastfeeding is crucial’. It highlights the importance of good maternal mental health so that the mother can be sensitive to the baby’s emotions and needs, helping the baby to develop secure attachment. Breastfeeding enhances a mother’s mental health while mothers who want to breastfeed but stop before they planned to are at greater risk of postnatal depression . However, instead of increasing the support available to mothers, many support services were cut in 2016 because of reduced funds available. Such preventative services were not seen as a priority. Freedom to choose how to feed one’s baby is valued in the UK and some people are concerned that mothers might feel pressured to breastfeed if it is encouraged. Ironically, advertising of follow on formula milks that might persuade mothers to switch from breastfeeding seems to cause less concern. Yet thousands of mothers make the often upsetting decision to stop breastfeeding before they wanted to. Where is the focus on these mothers and their suffering? Supporting breastfeeding is not about persuasion but about providing the infrastructure to enable them to continue; since some three quarters of mothers already opt to start breastfeeding, persuasion is irrelevant for them. If more mothers continued as long as they wished to, the proportion starting may well increase as expectant mothers will be less likely to hear negative messages. Unicef UK’s widely endorsed Call to Action in 2016 included developing a national infant feeding strategy board in each nation . What would a strategic plan encompass? The other WBTi indicators offer key points to include, such as Baby Friendly status being a universal goal, legislation in line with World Health Assembly recommendations, adequate protection for breastfeeding in the workplace, local support that is of high quality and integrated, and health professionals who have adequate training is supporting breastfeeding. If representatives of the four UK nations meet regularly they can also share ideas. Back in 2003 the World Health Organisation produced the Global Strategy for Infant and Young Child Feeding, which includes recommendations for national leadership, and this was followed in 2008 by the European Blueprint document [5,6]. Thus there are plenty of ideas available for developing a plan. The challenge is then implementation. Alongside national leadership by governments, as described above, the breastfeeding support charities, relevant royal colleges and other similar professional bodies, campaigning organisations and interested individuals can both amplify calls for change and help to bring it about by collaborating. The infant feeding coalition meeting in June 2016, reinvigorating the idea of the former Breastfeeding Manifesto Coalition, demonstrated the keenness there is to work together . Unicef UK’s Baby Friendly consultation on developing an inclusive Foundation provides an urgent opportunity to influence this – urgent because the deadline is 31 January 2017 . Please read the consultation document and respond to the survey, thus helping to influence the future. Also, check out our campaigning guidance for you to contact your MP and discuss issues highlighted in our report . Unicef UK (2016) Call to action for breastfeeding in the UK. WHO (2003) Global Strategy for Infant and Young Child Feeding. European Commission, Directorate Public Health and Risk Assessment (2008) Protection, Promotion and Support of Breastfeeding in Europe: A Blueprint for Action. 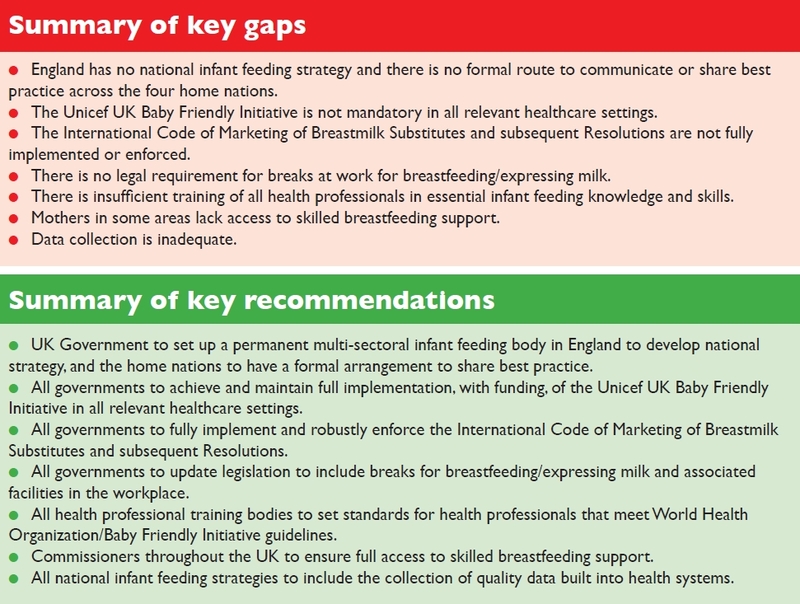 The first World Breastfeeding Trends Initiative UK report is launched!